Section of Halteria showing the extension of buccal cavity and the cytopharynx passing into the cell. 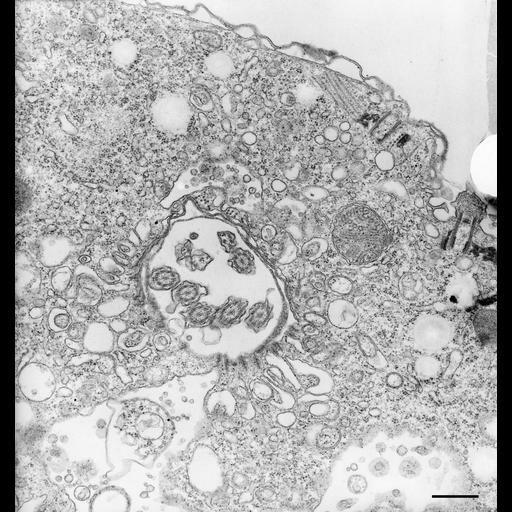 Vesicles accumulate at the cytopharynx next to the lamellae. These vesicles may be homologs of discoidal vesicles and acidosomes as described in Paramecium. A large nascent food vacuole lies next to the cytopharynx. Basal bodies without cilia lie next to the pellicle and are associated with nemodesmata that pass into the cell as bundles of microtubules. TEM taken on 3/18/71 by R. Allen with Hitachi HU11A operating at 75kV. Neg 13,750X. Bar = 0.5µm. The negative was printed to paper and the image was scanned to Photoshop. This digitized image is available for qualitative analysis. A raw, unprocessed, high resolution version of this image (CIL:7612) is in the library and available for quantitative analysis. Standard glutaraldehyde fixation followed by osmium tetroxide, dehydrated in alcohol and embedded in an epoxy resin. Microtome sections prepared at approximately 75nm thickness. Additional information available at (http://www5.pbrc.hawaii.edu/allen/). Carolina Biological Supply Co., NC, U.S.A.